College Colors Day: Alexia Wears Murray State's Navy and Gold! Confession time: I haven’t lived in Murray, KY in over 20 years. However, I still get excited any time I see something blue and gold, hear my Racers mentioned in a sports article or see my friends' Facebook pictures of their family dressed for a Murray State Racer football or basketball game! My obsession with the Racers has always been there. My dad was a theatre professor at Murray State for over 30 years, it is my mom’s alma mater, and my grandfather was on their basketball team in the 1930’s when they still played in Lovett Auditorium. I have been going to games as long as I can remember. At the football games I loved the atmosphere almost as much as the game. : the 101st Airborne division paratrooping the game ball to the 50 yard line, the Racer band would perform the amazing halftime shows and saying hi to the announcer (“Hi, Pete”) , the announcer saying hi back to them over the loudspeaker (“Hi Racer Band!”), and my favorite tradition of a horse running a victory lap around the track surrounding the football field when the team scored a touchdown. In the winter basketball season was in full swing. We would go to at least one game a week. When I lived in Murray the games were still played at Racer Arena. It was small, it got hot, it got extremely LOUD, and it was GREAT! It only held 5500 people, but for big games closer to 6000 fans packed in. Because it was so intimate you could see the players, get into the game and sing along with the Pep Band. The sea of blue and gold was crazy and usually intimidated the visiting team. I remember one game, close to the end of a season, where us winning meant we clenched the regular season championship. As the clock ticked down the entire arena was chanting and making the hand motions for “O-V-C” (Ohio Valley Conference). I remember cheering for Martin and Mann in the 80’s and Popeye Jones in the 90’s. Since moving out of the state I do not get to see my Racers play live. However, that has not stopped me from being a huge fan. I have been known to stream the game on my phone connected to an HDMI cable to the television to watch it. I have even Facetimed my parents (who have also moved from Murray) to show them the game when I could get it through my cable company and they could not. I’ll find the game being broadcasted on the local Murray radio station online and listen to it. I get excited to hear the basketball announcer, Neil Bradley, say “One minute, one minute left in the game.”) My Maryland-born children cheer for the Racers, loved Isaiah Cannan and Ed (the hair) Daniels, and watched them win the CollegeInsider.com Tournament with me this year. They have not been to a MSU basketball game since 2009, but constantly ask when we can go back to see them play. Repping the Wildcats and the Racers on the classroom door. Where I live now people tend to cheer for professional teams. However, I’m an NCAA girl through and through! During THE tournament I put my Murray State sign up on my door (along with another sign, because I am from Kentucky!) Murray State is my favorite team to cheer for and I can’t wait for this season to begin! I’ll be watching with my Blue & Gold pompom and my Racer shirt waiting to see if Cameron Payne can lead the Racers back to the NCAA tournament and hopefully past that second round to the Sweet 16. 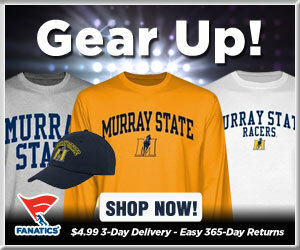 GO RACERS!